Sandhill Cranes, Masters of the Sky! 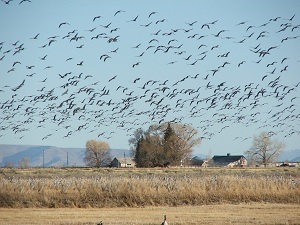 Twice a year over 20,000 Sandhill Cranes migrate through the San Luis Valley. To help celebrate this magnificent migration, Monte Vista started their Annual Crane Festival. 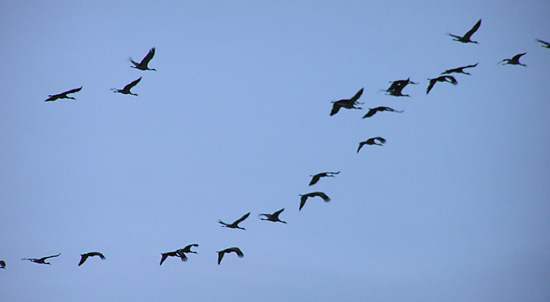 It takes place during peak spring migration which occurs during mid-March. In 2013 the Crane Festival will celebrate 30 years and the schedule is out! The festival is March 8th through the 10th. Don't miss out on the sunrise or sunset tours to see the most cranes and learn about the area. To see a full list of activities click here. During the Monte Vista Crane Festival you can find wildlife experts, local naturalists, and biologist who present educational workshops for the public. Most of the workshops and tours are free, but they ask for donations to help offset any costs. There are also bus tours that take visitors to the Monte Vista Wildlife Refuge to see the cranes. Here visitors can see more cranes as well as bald eagles, hawks, and a large variety of other birds. Each bus tour has a knowledgeable guide to help make the trip more enjoyable. There are also special tours that feature raptor identifications, sunset trips to view the cranes, and a visit to areas of the wildlife refuges that are normally closed to the public. There is also a craft fair in the Ski Hi (pronounced sky)Park building where you can find many unique crane designs and items to buy as well as homemade food, quilts, metal art, and many other booths. A dinner with live entertainment, a pancake breakfast, and concessions make for an enjoyable time. Local Bed and Breakfasts and hotels fill up quickly as people from all over the world come to see this magnificent migration, so please plan ahead! You can usually always hear the cranes flying over your head before you see them so make sure to keep an ear and eye out for the cranes! It is a wonderful sound as they call to each other. Make sure to dress in layers and bring your heavy coat and gloves. The San Luis Valley is cold and windy during March and snow is often on the ground. You will want to get out of your car and look around as well as take amazing pictures so please dress warmly to make your visit more enjoyable. If you can’t make it for the exact weekend of the Crane Festival, don’t worry about it. The window to see the cranes in the spring is from mid-February to mid-April and from September to November in the fall. You might not see as many in large groups if you don’t visit close to the crane festival but you will still see quite a few. Don’t forget your video camera as you will want to capture the unique crane calls especially during their mating dances. I attended the 2011 crane festival bus tour because it has been quite a few years since I was on the actual tour and wanted to see if anything had changed. First, if you are going on the bus tour I highly recommend making reservations ahead of time. When I arrived at Ski High Park on Friday, March 11, 2011 there were four buses waiting to take people on the crane tour. I discovered that they offered bus rides to the people who had sent in reservations first, which I would expect. There was room for me to go on the tour, but I ended up on the fourth bus with several others who didn’t send in their reservations. 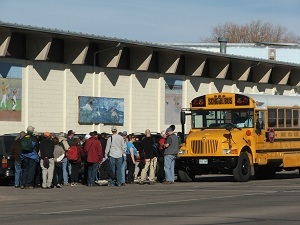 The buses headed south to the Monte Vista Wildlife Refuge. Our tour guide was a gentleman from the Division of Wildlife. The tour took about two hours. Much of the time was spent at the pull off areas along the Wildlife Refuge where we viewed about 1,000 cranes. We also saw a bald eagle. The highlight of the stop was when the cranes were scared which caused them to take flight, circle, and come back and land. I also learned that the Monte Vista Wildlife Refuge has an agreement with local ranchers and farmers in which when barley is planted, the farmer is allowed to take 60% of the crop, leaving 40% which is left standing so the Sandhill cranes, geese, and other migratory birds can eat the barley. As we continued along the Monte Vista Wildlife Refuge we saw more cranes and also spotted a coyote, one of the cranes predators. The Division of Wildlife provided spotting scopes and binoculars for people to view the cranes better. Bringing your own pair is advised but if you forget don’t worry because there are enough to share. I would certainly recommend that when you attend the Monte Vista Crane Festival that you make reservations and take the bus tour. There were a number of people viewing the cranes while we were at the turn outs in their own personal vehicles, however, you learn so much more with a tour guide. On Saturday I attended the Craft Fair held at the Ski High Park Building. The building was wall to wall with craft booths selling jewelry, homemade foods, quilts and quilt crafts, metal art, photography, barbwire art, jam/jellies, and kites to name a few. 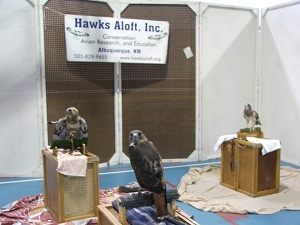 There was also an area where live hawks and owls were housed. At the Monte Vista Middle School, a mile from Ski High Park, there were workshops being presented. These included: This Sand is Your Sand by Patrick Myers of the Great Sand Dunes National Park, The World of Bats by Kirk Navo of the Division of Wildlife, Cranes of the World/Cranes of the Rock Mountains presented by Evelyn Horn, and Breeding Bird Atlas II Project by Lynn Wickersham. There was a Wildlife Photography with Weldon Lee which met at the Wildlife Refuge Office and covered basic camera operation, composition and photographing wildlife. As you can tell there is a lot to see and do at the Monte Vista Crane Festival. 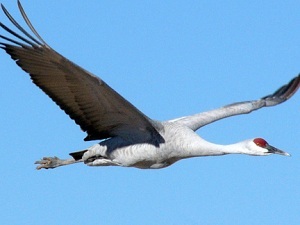 I hope to see you at the 2012 Crane Festival!! There are several subspecies of Sandhill Cranes and the ones that migrate through the San Luis Valley are the Greater Sandhills. 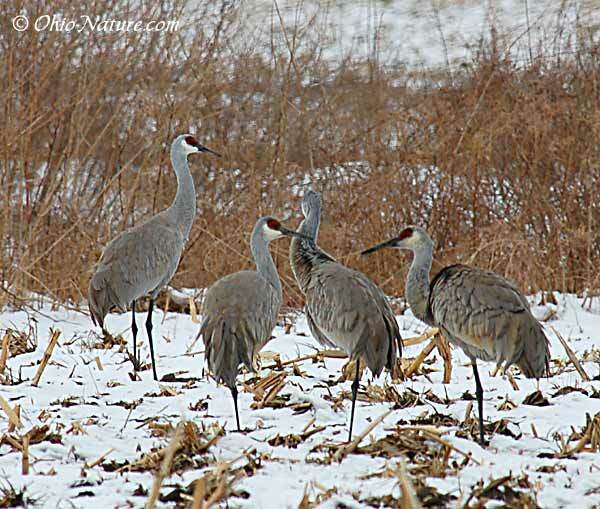 There is a small population of Lesser Sandhill Cranes that travel this migration route but the majority of the Lesser Sandhill Cranes migrate east of the continental divide through Nebraska. The Greater Sandhill Cranes stand about four feet tall and a have a 6 foot wingspan. They are mainly gray except for a red patch of skin of their foreheads. The Cranes breed in the greater Yellowstone area and winter on the Bosque del Apache National Wildlife Refuge near Socorro, New Mexico. During the spring the cranes arrive mid-February and most are gone by mid-April. In the fall the cranes arrive in early September and are mostly gone by mid-November. 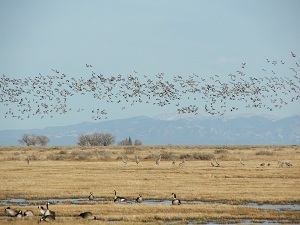 The San Luis Valley is an ideal stopping ground for these birds as it is rich in food. With so many barley and wheat fields there is plenty of food for this hungry flock. During the day most of the birds can be seen in farmer’s fields eating the left over grain or on the Monte Vista Wildlife Refuge. At night the cranes travel to the nearby Rio Grande River and ponds to feel safe in the water. 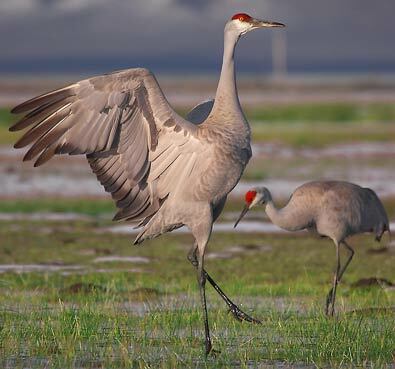 The San Luis Valley is also where the cranes perform their courtship dance. They leap and bow while raising and lowering their wings. The cranes also make a croaking sound to one another. Once a bond is formed between a male and female they will stay together for life. The Sandhill Crane migration is a unique experience that I look forward to every year and I hope you will visit the San Luis Valley during their migration.